@VernonO. : Everybody should feel heat when a team doesn't win. the Braves are only 1 of 7 teams in MLB who have failed to win a playoff series since 2001. Is this acceptable? Wren has only perpetuated mediocrity the past 6 years going on 7? How about Schuerholz? Should he feel heat? @Chip: Uggla has been extremely classy and handled things great. @Hugo: Spin. Have you noticed that in every city in America stadiums now are being built downtown, not in suburbs? @FieldOfDreams: Wren has been reticent to trade pitching prospects in past. @wanderboyd: Check back after season. @Jeff: To deal with? Smoltz or Chipper. @jrhode: Oh come on yourself. That doesn't change the stadium deal. @Jeremy: Not avoiding the question but it's really way too early to speculate. But I tend to doubt a major move. 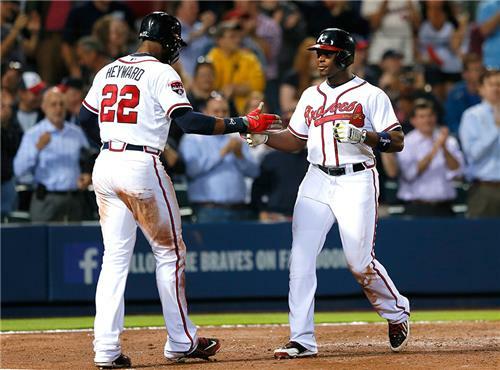 Braves had a big night at the plate against the Brewers at Turner Field last night. I'm told we're wrapping this up, folks. Thanks so much for participating and for your questions. Lots of good ones. Take it easy and enjoy your day! That's a good question, Chris. As far as hitting goes, I think Freddie Freeman is a guy everybody looks up to and knows what he's doing at the plate. He's not super vocal though. Chris Johnson, Justin Upton. Jason Heyward. all have leadership qualities. Kyle Wren and Jose Peraza also might be future options to lead off, but they are both a year or two away. I think you can make a case for Simmons to bat in the second spot....though Simmons really hasn't gotten on track yet this season. maybe hitting with some better protection would help him. ...I think LaStella could definitely be the kind of guy you want hitting second. Think he'd need a little time under his belt before they'd put that on them though. We'll have to see. I'm with you that there aren't a ton of obvious leadoff options. Why do we just talk about the leadoff spot? I think that unfortunately, right now, J-Hey is our best leadoff option. But why have we not tried Simmons in the 2 hole? J-Upton hits well there but that should not matter, Gattis is too inconsistent to be a cleanup hitter, and CJ doesn't have enough pop to be a 5. If not Simmons, then it needs to be Pastor or La Stella when they get their chance. Thoughts? Nobody immediately comes to mind other than Matt Lipka, who has some serious wheels. Loved to watch him run during spring training. But his development was stalled by hamstring injury, so he's not an immediate solution. ...and shoot, Constanza can give you speed and a slap hit, but he's not a long-term answer in the leadoff spot. Seems to do good things when he gets opportunities up here, though, doesn't he? Carroll Do we have any one in the minors with speed capable of being a legitimate lead off hitter? Hm. good question. Always love a good Maddux question. Based on what contract Santana was looking for last winter, I think you'd be safe to make him a qualifying offer and take your draft compensation. ...and i think it was a good move to bring Maddux back for a year, even when somebody lost a poker hand there! Regarding Santana, do the Braves make a qualifying offer to receive draft compensation? Or, do they remember what Greg Maddux did when the Braves gave him a qualifying offer? Cliff, I'm not sure on what planet a reporter would ask a player if he's afraid of a fence and I'm never going to ask that question, so not sure how to answer your question. I've seen B.J. have problems with balls in gaps, not just at the fence. But i think his glasses have helped him in the field. there was a play he got hurt on right before the all-star break last year that i think he overran, maybe because he couldn't see the ball well. I do think Andruw Jones is the best center fielder i or we will ever see. And he does kind of ruin the position for me now. He...was....amazing. It seems like the Braves haven't been able to find/hold on to a true lead off hitter in a long time. There's been complete whiffs like McClouth, Schaffer, and then guys like Bourne that we couldn't afford to keep around very long. Are there any guys to keep an eye on that might eventually fill our need for a lead off hitter? Not that there is anywhere to put him until we get rid of somebody anyway, but was curious about possibilities to address that need down the road. I don't want to get much into that, since it's such a polarizing subject and some fans seem so eager to jump on anyone who's critical of replay and immediately say we're dinosaurs for liking things as they were, including the manager/umpire confrontations. But I hate the replay system. What would you do to improve the umpire replay system? Do you think the replay system is making umpires looK bad since so many calls are being over turned? Eventually I think he will. But he just got married again, and is doing a lot of stuff with his ranch as a hunting destination, etc. So it might be a few years before he is ready to dive into something as time-consuming as hitting coach. That's not a cush job, takes a whole lot of ours, and with the money that top players make these days, it's a MASSIVE pay cut from what they earned while playing, with just as many or more hours involved and obviously all the travel and spring training away from home, etc. So maybe just an advisory role of some kind in the near future? I don't know, helping out hitters and working in the broadcast booth, that kind of thing. Sort of live Glavine, but maybe more involved on the field. But I don't know. Just talking out my ... Speculating. Do you think Chipper will have any role with the Braves in the future, whether it is something in the front office, or a coach or broadcaster or something? Oh, wait. I just re-read your question. You said non-HOF Brave. Dale Murphy. who is your all-time favorite non-HOF Brave? Not sure what you mean by the question. Yes, we are definitely spoiled watching best defensive shortstop in the game, far and away the best in my opinion. But his errors last night were costly (should've been two, not one error). Not an either/or situation. He had a bad game. It happens to even the best. The error led to two unearned runs in a 4-3 game. Do you think we are spoiled to watch Simmon's magic day in and day out, that a game like last night, an uncommon errors, cost us the game? it's not an "experiment," he's a veteran bench bat, nothing more. How long does the Ryan Doumit experiment last? Not seeing much out of him so far. It's an intersting/difficult situation. Unless they skip him a few times or start bringing him out after 5-6 innings instead of 7-8, I don't see how he can stay in rotation all year and then be at 175 early in September. They've made it clear that there's a certain percentage increase that they're willing to go to in regards to young pitcher's previous season innings total or career-high total and max increase they'll let him go to over that amount. Which is only reason it makes some sense to put Wood in 'pen for a while as a second lefty, then get him stretched back out and not have to worry about the innings limit late in season. What are your thoughts on the Woods IP limit this season? Pretty simple: Thumb was swollen at base, fatty part of hand, after being jammed by pitch. Throbbed in fifth inning at Miami, couldn't grip ball. Why make him try to pitch again on schedule when Floyd had to come off DL anyway? Thoughts on skipping Santana's start? Don't think so, not before September, unless there's an injury. Any chance Bethancourt will get a call this season? Yes, it does. Just being honest. Watching way too many close pitches in those situations, especially this year. What do you make of Upton watching another called 3rd strike last night? Seems to be a trend with him over the last 2 seasons in close situations.